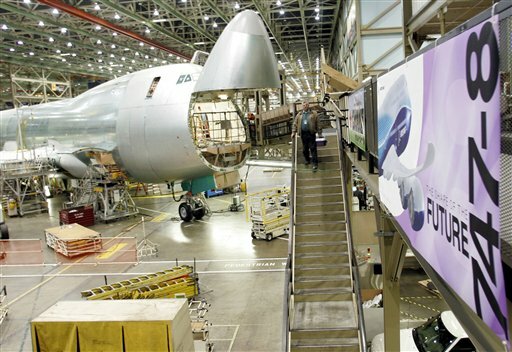 Boeing on Tuesday said it will record a $1 billion charge because of a delay in producing a new version of the 747 freighter jet, blaming slow sales and late design changes . It's the second time in four months that the company has announced delays in delivering a new aircraft model. In June, it announced further postponement of the 787, a highly anticipated passenger plane which is more than two years behind schedule. The troubles come as the airplane maker grapples with dwindling orders amid the global economic downturn, which has undercut demand for air travel and cargo services. Some airlines have been forced to cancel or delay plans to buy new planes. Boeing has cut costs and announced plans to slash thousands of jobs and scale back production of some aircraft. Boeing's latest hit will result in combined third-quarter charges of $3.5 billion for both the 747 and 787 programs. The charge from the 747-8 _ a larger plane than earlier versions _ includes $640 for higher estimated production costs for the Chicago-based company and its suppliers. Late engineering designs resulted in the plane being reworked and in manufacturing disruptions. The charge also includes $360 million stemming from Boeing's decision to hold production at 1.5 airplanes per month rather than boost it to two, a result of slow orders. The 747 has been flying for four decades and is one of the world's best-known airplanes. The 747-8 version was unveiled in 2005 and is designed to be larger and more fuel-efficient. The passenger version of the 250-foot plane, called the Intercontinental, seats 467 passengers. Boeing now expects the first flight of the 747-8 by early next year. First deliveries of the 747-8 freighter are now expected in the fourth quarter of 2010. First deliveries of the passenger version remain on schedule for the fourth quarter of 2011. Problems with the 747-8 program are hardly new. Last year, Boeing said it was postponing deliveries because of design changes and a strike that shut down commercial jet factories for eight weeks. The charge for the 747-8 is just the latest financial problem for Boeing, which is struggling with the costly development of its 787, a mid-size passenger jet built with lightweight carbon composite parts to improve fuel efficiency. The company's credibility suffered a blow in June when it announced the latest of many delays of the 787, saying part of the aircraft needed to be reinforced. Two months later, Boeing said the plane would be ready for its inaugural test flight by year's end, with first deliveries in the last three months of 2010 _ more than two years behind the original schedule. Boeing also said it would book a $2.5 billion charge in the third quarter for the first three 787 test planes, which lack commercial value. The 787 delays are expected to cost Boeing billions of dollars in anticipated penalties and costs, and airline customers and Wall Street analysts have grown skeptical of the company's timetable for the plane. Still, the 787 remains Boeing's best-selling new plane to date, with 850 orders. Boeing said it will update its 2009 financial guidance on Oct. 21 when it reports third-quarter results. Shares feel 41 cents to $51.87 in afternoon trading.